Novak Djokovic ruined Roger Federer’s ambitions of a 100th career title as he outlasted his great adversary 7-6(6) 5-7 7-6(3) in an epic Paris Masters semi-final match on Saturday. It was a match and win that stretched his remarkable unbeaten run to 22 matches. In a 47th meeting between the two greats, the stubborn Djokovic simply refused to be beaten. He eked out a fourth successive victory over Federer in a tiebreak decider after three compelling hours. It gave the Serbian the opportunity to mark his return to world number one on Monday by winning a record-extending fifth Paris title in Sunday’s final. He is up against Russian Karen Khachanov, who earlier crushed Dominic Thiem 6-4 6-1. Djokovic, who had complained of competing with flu-like symptoms in his previous matches this week, was proud and relieved to repel a wonderful challenge from Federer. And, to make matters worse for him, the Swiss appeared close to his imperious best. “We’ve had epic matches throughout our rivalry but this one definitely ranks as one of the best matches we played. High quality tennis,” Djokovic told reporters. Even though he was not broken once, it was still not enough for the 37-year-old Swiss. His nerve failed him in an anti-climactic final tiebreak in which he served a double fault and made two more careless groundstroke errors. Federer was seeking to become only the second man after Jimmy Connors to win a century of professional tour titles following his 99th win in Basel, only to fall agonisingly short. The 20-time Grand Slam champion lost the first set in spite of having held set point in the tiebreak and had Djokovic in trouble in the final set. That was when the Serb received a code violation at 4-4 for chucking his racket away in disgust after the Swiss had saved two break points. Ultimately, though, Federer, who saved all 12 break points on his serve, saw his resilience ended. Djokovic extended his career lead over the Swiss to 25-22 after their longest-ever three-set duel. It was the first time in their 12 years of battling that Djokovic had won four matches in succession against Federer. He equalled the run the Swiss himself had once achieved at the dawn of their rivalry. Earlier, Khachanov showed why he is one of the finest young talents in tennis with a thunderous victory over Thiem. The 22-year-old, 6ft 6in Russian, already the owner of two indoor hard court titles this year, crushed his Austrian friend and practice partner in 70 one-sided minutes. “It was one of my best matches, and what I’m happy about is that I was increasing my level, which shows that I’m becoming a better player,” Khachanov, who reached his first Masters 1000 final, said. 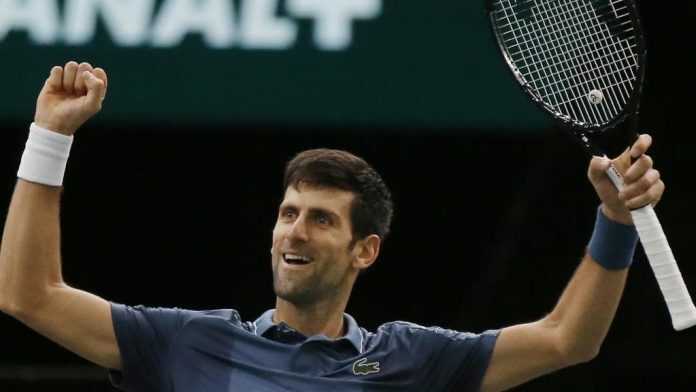 The 18th-ranked Muscovite overpowered a third top-10 player in successive days, having hammered Alexander Zverev in the quarter-finals and defeated John Isner in the last-16.